Click the button below to add the Top to Bottom to your wish list. Product Description: Top to Bottom Roof & Deck Stripper is a highly concentrated alkaline formulation designed to quickly remove old, worn stains and sealers from wood surfaces prior to application of new finishes. Quickly restores outdoor weathered and heavily grayed wood surfaces. Top to Bottom will remove gray wood fiber, failed wood stains, tannin bleeding, water stains, mildew, algae and discolored surface fiber from decks, fences, wood siding and log homes. Use to restore wood to its natural color and prepares surfaces for re-coating. 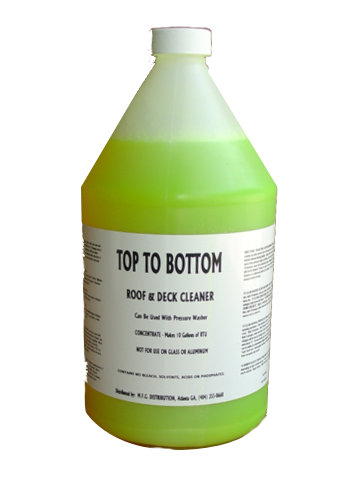 Application: Top to Bottom Roof & Deck Stripper is manufactured to quickly remove solid color or semi transparent oil-based stains and water sealers. Top to Bottom Roof and Deck Stripper will also remove damaged and discolored wood fiber from exterior wood surfaces such as decks, wood siding and log homes etc. If wood-stain and wood-paint removal is required use Clean & Brite or BST Stripper. Heavily weathered wood surfaces may look fibrous after rinsing. Immediately brushing along the wood grain helps remove the loose fiber to give a smoother finish. Wood rich in tannin may darken during restoration - this is temporary. Using Top to Bottom to restore wood before a coating of stain or paint will help even penetration of the coating. The result will be a longer lasting, even and natural looking finish. Directions: Top to Bottom works upon applying. Dilute Top to Bottom with water up to 4 parts (makes two gallons). Use full strength on failed wood stains or heavily grayed wood. Apply diluted solution liberally with a pump-up garden sprayer to all areas to be treated. Mist area to maintain wet working area - do not allow to dry on surface. Once coating softens, usually 15-30 minutes Agitate lightly with a stiff brush or floor broom to help remove residue. Work in the direction of grain to minimize "grain raising" on wood surface. Finally spray cleaned deck thoroughly with a garden hose or power washer to remove any cleaning residue. Rinse twice if needed and brush with the grain of the wood. A power washer will eliminate the need for agitation. Note that older or badly weathered wood may still be rough or fibrous after being restored. Some sanding may be required for appearance.